History of buttermilk: What’s the difference between cultured buttermilk and traditional buttermilk? How buttermilk lost its butter. My parents were right. The buttermilk was sour, tart: awful. So overwhelmingly acidic was its flavor that I hardly even noticed the creaminess. I abandoned the glass after one sip. Where had I gone wrong? My mistake was assuming that the buttermilk I had ordered would be the same kind of buttery buttermilk that Laura Ingalls Wilder had drunk in the late 19th century. This was a bad assumption. What we call buttermilk today has nothing at all to do with butter. In fact, the stuff known as cultured buttermilk at your local supermarket—i.e. milk that has been deliberately soured—is a 20th-century invention, and the product of a health-food diet craze dating back to the flapper era. “As long as people have made butter there’s been buttermilk,” says Anne Mendelson, a culinary historian and the author of Milk: The Surprising Story of Milk Through the Ages. Careful: Here, she’s talking about a byproduct of churning whole milk or cream—the thin, white liquid that Wilder wrote about. So how did that buttermilk, the original buttermilk, turn into the thick, sour, yogurty beverage I sampled at Threadgill’s? The confusion surrounding this drink dates back to the 18th century or before. Until the age of refrigeration, milk soured quickly in the kitchen, and most butter ended up being made from the slightly spoiled stuff. As a result, some historical sources use the word buttermilk in the Laura Ingalls Wilder sense, to describe the byproduct of butter-making; others use it to describe butter-making’s standard ingredient at the time—milk that had gone sour from sitting around too long. To make matters more confusing, the butter-byproduct kind of buttermilk could be either “sour,” if you started out with the off milk that was itself sometimes called buttermilk, or “sweet,” if you started out with fresh cream (like Laura’s mom did). So, prior to the 20th century, buttermilk could refer to at least three different categories of beverage: regular old milk that had gone sour; the sour byproduct of churning sour milk or cream into butter; and the “sweet” byproduct of churning fresh milk or cream into butter. Few people in the English-speaking world cared very much about this lack of clarity. In Western Europe and America, the only people who bothered to drink buttermilk of any kind were the poor farmers and slaves who needed all the calories and nutrition they could get. Everyone else fed sour milk and butter-byproduct to their farm animals. We know from accounts recorded for the Federal Writers’ Project of the WPA that American slaves sometimes drank butter-byproduct buttermilk “slopped into hog troughs, maybe with some stale cornbread thrown in,” according to Mendelson. With the combined purchasing power of immigrant populations, health nuts, and bakers, cultured buttermilk was selling at a peak rate of 1,140 million pounds annually by 1960. Today’s buttermilk sales are less than half that—yogurt has ascended as the cultured-milk product of choice among health-conscious folks over the past few decades, even though both yogurt and buttermilk contain healthful probiotics. Butter-byproduct buttermilk, meanwhile, remains mostly the province of small farmers and DIYers. Large butter manufacturers now dry their butter byproducts and sell them to processed-food manufacturers as means of adding body and texture. (If you’ve ever eaten ice cream or a candy bar with “buttermilk solids” on its ingredients list, you’ve consumed the byproduct of butter.) In other words, the “good, fresh buttermilk” I’d read about as a child isn’t exactly easy to get your hands on. But I wanted to know what the original buttermilk, the byproduct kind, looked and tasted like. Was it anything like the tart stuff popularized by J.H. Kellogg and sold around the country starting in the 1920s? If I’d had a swig of real buttermilk when I was 7, would I have liked it? I set out to make some myself, which meant making butter from scratch. That didn’t turn out to be so difficult: After vigorously whisking a carton’s worth of heavy cream for 20 minutes or so in my stand mixer, I found myself with a big lump of yellow fat and a thin, white liquid. The liquid had several bubbles dotting its surface but was nowhere near as thick as cultured buttermilk. I strained it and took a sip. It tasted at first a lot like milk, then my mouth filled with a faint butter flavor—maybe there were a few tiny globules of fat floating around in there—followed by a watery aftertaste. 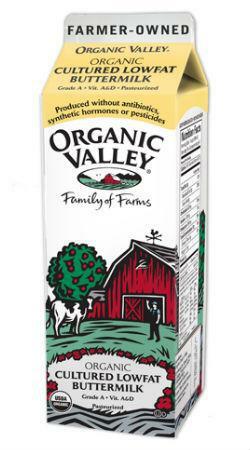 There wasn’t a hint of acidity; in fact—though it wasn’t bad—“good, fresh buttermilk” was kind of bland. But at least I understood what Laura Ingalls Wilder had been talking about. My homemade buttermilk was definitely more drinkable than the cultured stuff. (To make sure, I tasted a bit of store-bought buttermilk right after sampling the butter byproduct. Yep: still thick and sour.) But it’s not something I’d drink every day for the flavor, and it’s not particularly healthy, either. Uncultured, churned buttermilk is relatively low in calcium (compared to other dairy products) and doesn’t contain any “good” bacteria. Further, my homemade buttermilk didn’t reveal any special attributes when I tried to bake with it: A batch of buttermilk biscuits made using the DIY stuff (sans baking soda, since there wasn’t any acidity in the liquid) were indistinguishable from any biscuit made with regular milk: dry, crumbly, ho-hum. Given its unremarkable flavor and texture, I can only conclude that traditional buttermilk is a thing of the past for good reason. But that doesn’t mean I’m happy with the state of the buttermilk section at my local supermarket. Why is cultured milk still low-fat, as a rule? Cult of slenderness be damned: Whether you’re drinking your dairy in a glass or baking it into a biscuit, the kind with higher fat content usually tastes better. I’m guessing the same goes for buttermilk, too.